Blistering triple-digit temperatures seemed a fitting forecast for an event dedicated to the appreciation of nature’s extreme condition survivors. The 31st annual Inter-City Cactus Show & Sale hosted by the Los Angeles County Arboretum & Botanic Garden is an unusual showcase put together by the Los Angeles, Long Beach, and San Gabriel Valley Cactus and Succulent societies dedicated to offer a stage to a spectacular array of exotic cacti and succulents sourced from arid deserts, semi-arid jungles, and mountain highlands from around the globe. 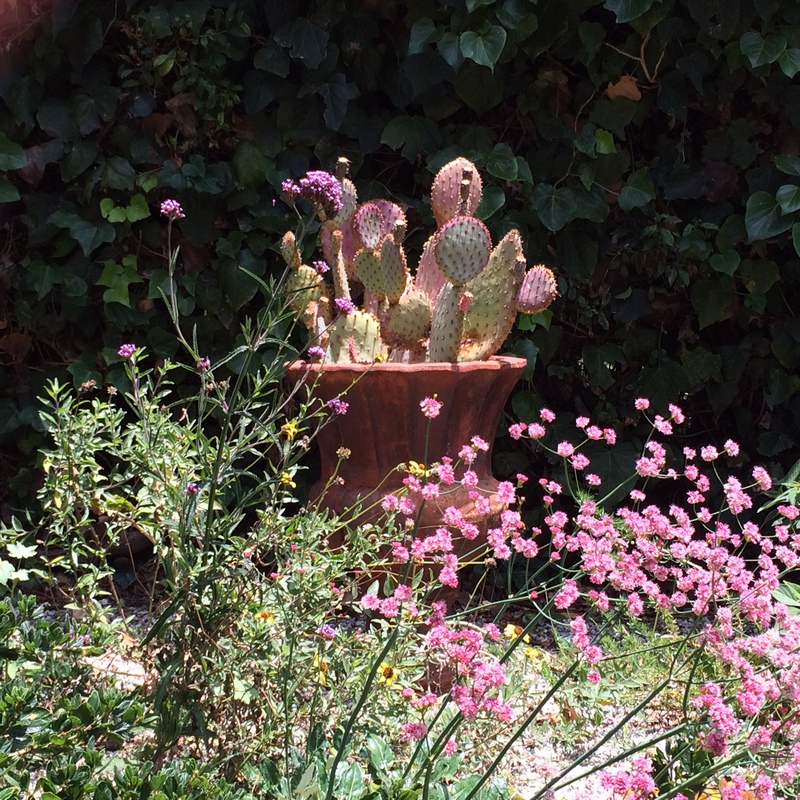 This is Comic-Con for people who love drought-tolerant plants. Outside the exhibit hall an array of cacti and succulents were made available across long tables for attendees to peruse and purchase, each ranging from a couple dollars for common specimens all the way into the thousands for rarities that might require multi-year loan approval (I learned to abide by “look, but don’t touch”, lest I find myself the new proud owner of a $1,300 Cyphostemma uter). I observed attendees shuffling and cradling cardboard boxes full of lithops (aka living stones), euphorbias, stapelias, and other recognizable varieties, picking each with the same recognizable furrowed brows expression I usually exhibit while deciding which pastries to add to my tray at a Chinese or Korean bakery. The most unique and unusual specimens were offered by the aptly named, Rare Succulent Nursery, a dealer specializing in mostly African varieties, most I had never seen before. Many looked almost pathetic, small plants with the hunched stature of a dog caught chewing on a shoe and scolded for its misbehavior, attributed to the fact that any life that must survive the harrowing conditions of hellish daytime desert temperatures only to weather frost-forming cold nights is going to look humble by necessity. Even so, the prices attached to these plants reminded me to never assume price according to size. As much as I enjoyed navigating the traffic jam of grizzled buyers and literally melting with every passing minute outdoors, I knew something better awaited within the walls of Ayres Hall (besides air conditioning): over 1,500 prized plants competing for ribbons and medals. All manners of spikes, paddles, and numerous shapes defying explanation (one cactus was comprised of stacked spheres, obviously the inspiration for a Super Mario Bros. enemy) vied for prizes awarding health, color, and composition. My wife and I spent a few hours doddling slack-jawed, inspecting each entry with the same “OMG” expression of a child peering inside their first aquarium, overwhelmed by the diversity of otherworldly life before our eyes. We left with a greater appreciation for plants that can take decades to grow even a few inches, evolved to fight for every nutrient and stave back the elements with quiet fortitude. It’s a wonder more Angelenos aren’t into growing and tending succulent and cacti, as our temperate to hot dry summers seem a good fit when compared to our city’s ongoing obsession with tropical plants and lawns for landscaping. The arid lands of Africa, South America, Australia, and our very own Southwest States all seem a better template for landscape design in a city challenged by drought conditions and increasing summer temperatures. 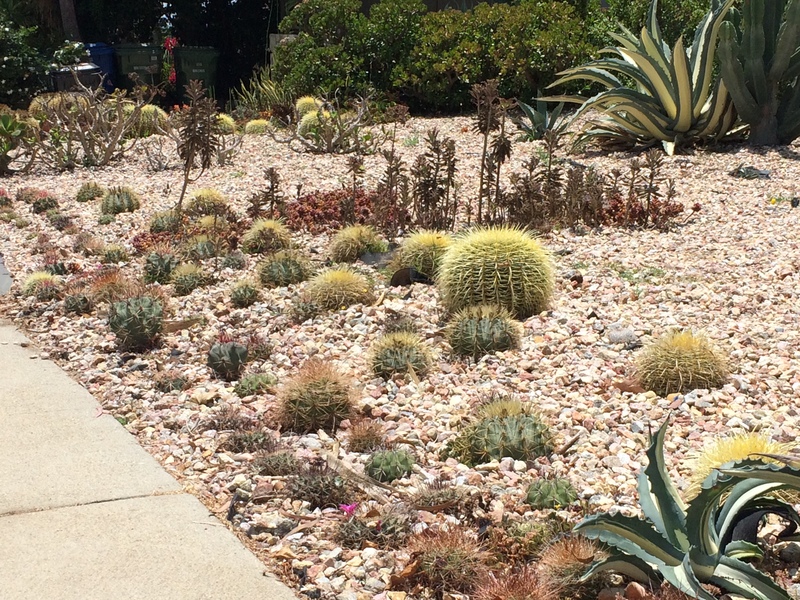 Who knows, perhaps in time xeriscaped cactus and succulent gardens will become the rule rather than the exception here in Los Angeles…but probably not in my lifetime remembering how much Angelenos love their lawns. I personally favor gardens that combine different types of plants in the informal manner of cottage gardens. I am also a fan of succulents, with an appreciation for their use in “California-friendly” gardens. While succulents (and cacti) are generally marked for drought tolerant yards, don’t over look them as ornamental additions in any California garden, for these plants can add visual depth and interest when contrasted against the textures, color, and character of many garden perennials and shrubs. 1. 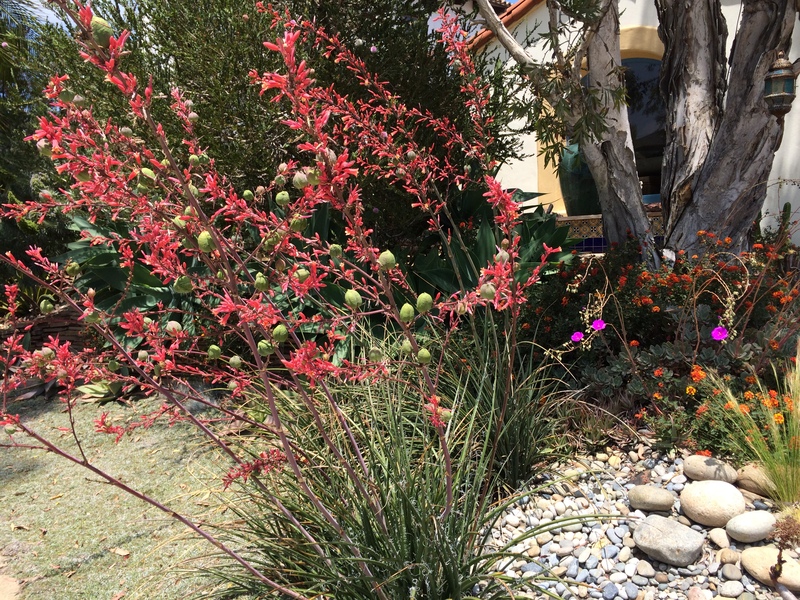 Match your plants’ watering needs by zones: Don’t assume all drought tolerant plants have the same watering requirements. The cultural needs of succulents, for example, are as diverse as the number of plant species found in its broad category. 2. Consider the soil: Water is not the only consideration for a garden’s success. A water-efficient garden begins with the soil. 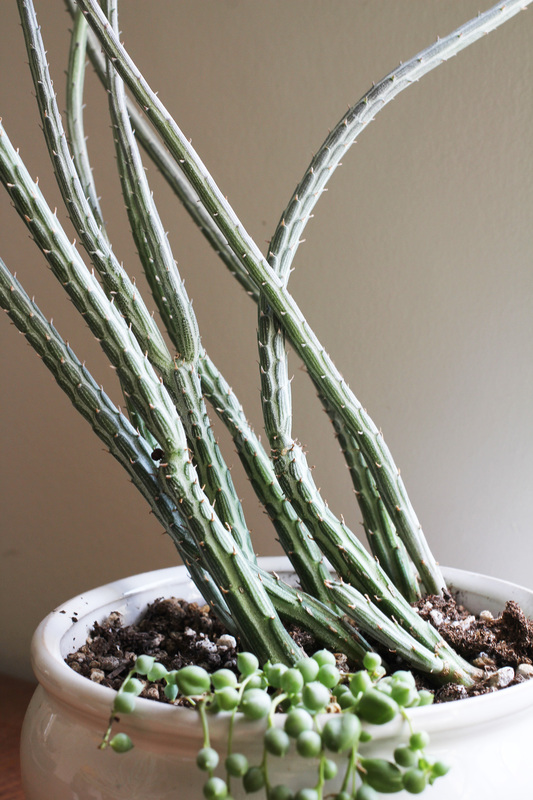 For example, the National Capital Cactus and Succulent Society recommends this tip: “A soil mixture for succulent plants should have a good crumbly structure. To test your soil mix, moisten and then squeeze with your hands: the mixture should not form a lump but crumble loosely.” So if you are interested in water conservation, the natural sciences, or simply having a green thumb, then take the time to learn about the plant/soil/water cycle. You will be a better gardener for it. 3. Factor in scale and spacing: Aloes, Agaves, Aeoniums, Echeverias and Senecios are among the most popular succulents in use today. These plants can add architectural structure and beauty to gardens when designed appropriately for its scale and site conditions. 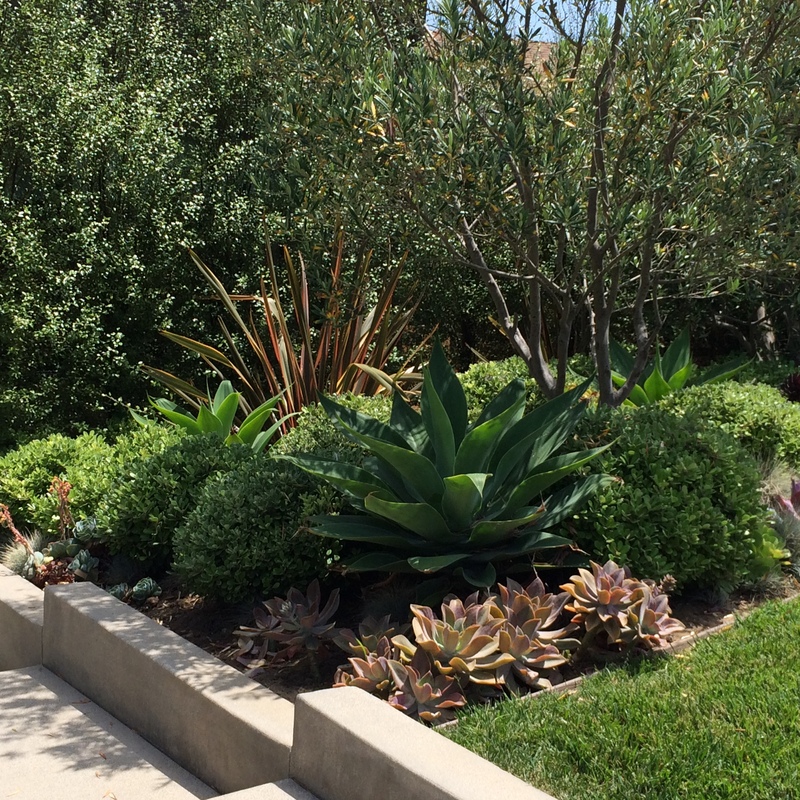 Leave enough space between larger succulents, such as some of the Agave species, and they can stand out as features. 4. 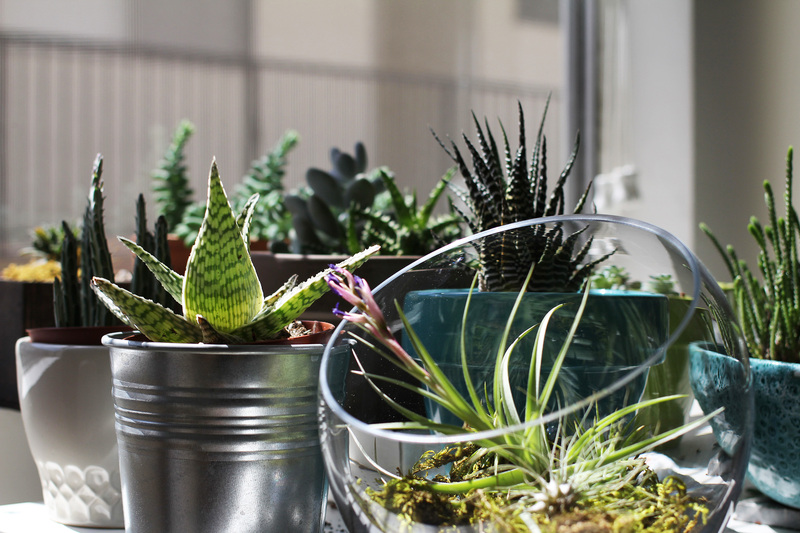 Mixing in planter arrangements: Cacti and other succulents also make excellent container plants. So if you must have a particular species that does not fit in with other plants in your garden, select a special pot or planter, make an arrangement with it and—voila!—you have a feature in the garden. 5. 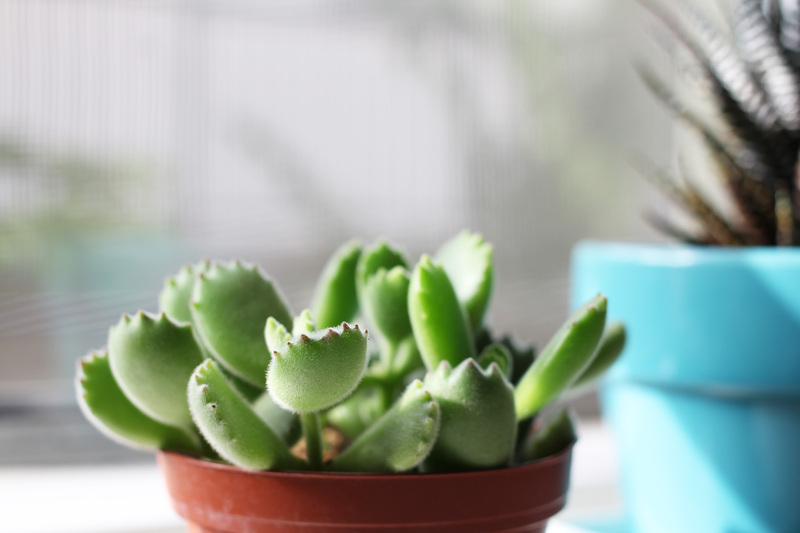 Consider placement: If you plant succulents in the front of your home, be careful where you place the ones with sharp points, spines, or prickly hairs. Certain agave species – such as the Agave americana – can get quite large with sharp points along its leaves’ margins and terminal spines. In my garden, no matter how lightly I move around my Opuntia (prickly pear cactus), its tiny hairs manage to attach themselves onto my gardening gloves, clothes, or skin. Locate these types of plants away from edges where people or their pets may walk by, run, or play. I also recommend you leave such plants out of parkways—those strips of green between the curb and the sidewalk. I remember an unexpected visit to my veterinarian to remove thorns from my dog’s paw after he stepped into a cacti-planted parkway. Parkway planting ordinances do vary by city. So educate yourself before you dig. But then, isn’t that what gardeners tell themselves all the time? 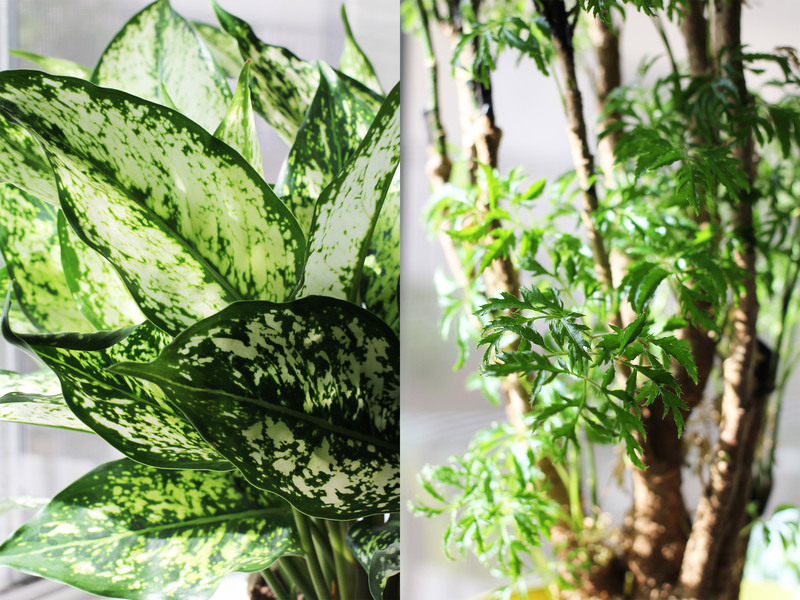 I live in a studio apartment, but I always dream about having my very own yard to do my plant experiments, whether it’s testing out texture and color combinations, or finding the right balance of plants that do well in the conditions it was planted in. But until that day arrives, I have my own little apartment garden sanctuary to tend. Every time I visit a nursery I can’t help picking up a new plant. I enjoy researching and experimenting different varieties, observing whether each plant thrives indoors with only a few hours of bright light next to my southeast facing window. Currently my dining table is filled with a mix of succulents and indoor plants, an apartment botanical laboratory where I can conduct plant growing experiments. 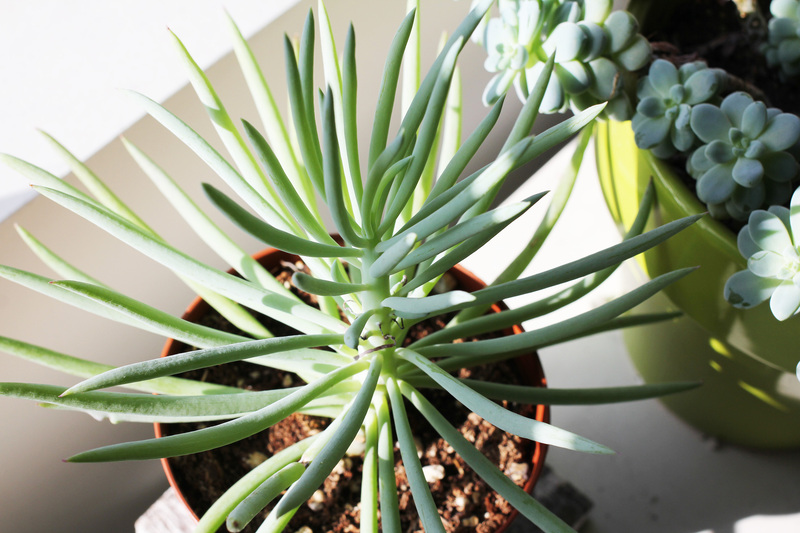 When grown indoors succulents tend to grow a lot slower, leaves are not as plump, and will lose some of their accent color. The slower growth habit works well for container gardening and terrariums, especially suited for small spaces. 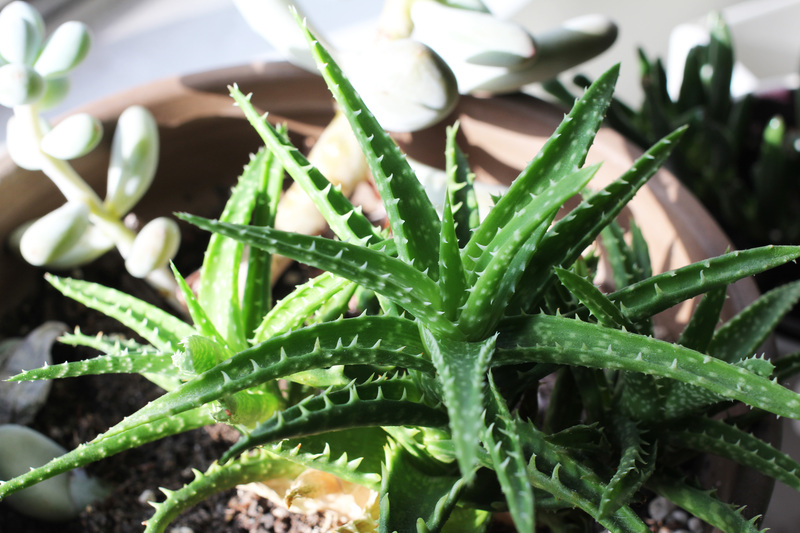 The key factors to success growing plants indoors is not to overwater the succulents; while indoors these plants requires less water since they are transpiring less in an indoor environment with low humidity. And definitely use pots with drainage holes. I’ve grown varieties where I mistakenly overwatered the plant, eventually resulting in leaves bursting in liquid death, shriveling, and eventually rotting away. Haworthia are small succulents endemic to Southern Africa and related to aloes. Senecio stapeliiformis – This succulent adds a nice vertical structure to your arrangement and will grow very fast. Senecio rowleyanus (String of Pearls) – Loves to drape over pots. Cotyledon tomentosa (Bear Paw) – This variety is especially sensitive to overwatering. Crassula ovata ‘Gollum’ (Gollum Jade) – This variety adds great contrasting textures within your garden. The leaves won’t be as plump and the red tips aren’t as vibrant when grown with low light. Spathiphyllum spp. (Peace Lily) – Very hardy, tolerates low light and easy to grow. Plus it helps improve air quality within your home. Ficus lyrata (Fiddle Leaf Fig) – Beautiful large leaves. Tip: Ikea sells a pretty good size of this plant for only $13. Polyscias fruitcosa – (Ming Aralia) – This variety can be kept small and is used often as a Bonsai Tree. It also likes humidity and filtered sun. Epipremum aureum ‘Neon Portos’ – This variety has a beautiful lime green color. They tend to lose their brilliant neon color if they don’t receive enough light. Sansevieria spp. 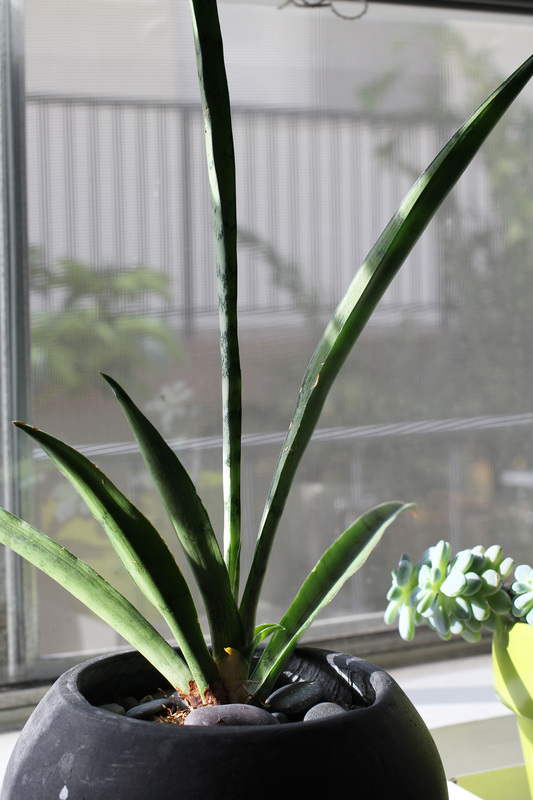 (Snake Plant) – Very hardy and seems to thrive with negligence. *Tip: Varieties with dark green leaves tend to do well indoors.